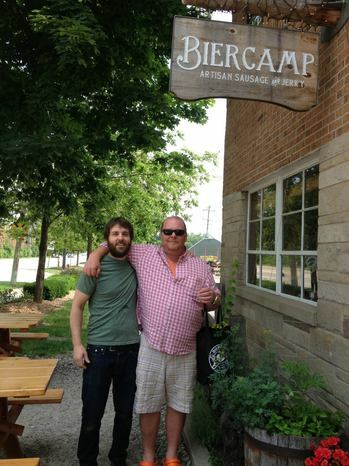 Posted on Mon, Jun 24, 2013 : 7:25 p.m.
Biercamp co-owner Walt Hansen with celebrity chef Mario Batali in front of Biercamp on Saturday. Celebrity chef Mario Batali, decked out in his signature orange Crocs, made a stop at Ann Arbor's Biercamp Artisan Sausage & Jerky on Saturday. According to the photo posted on Biercamp's Facebook page, Batali was stocking up for a trip to his vacation home on the Leelanau Peninsula. This isn't the first visit to Ann Arbor for Batali. He previously has tweeted about his love for Mani Osteria and Frita Batidos. Batali's influence can be felt — and tasted — across Ann Arbor. Biercamp's co-owner Walt Hansen is a former Batali protege, as is Vellum chef and owner Peter Roumanis. Biercamp is located at 1643 S. State St. just past the Produce Station. Jessica Webster leads the Food & Grocery section for AnnArbor.com, a part of the MLive Media Group. Reach her at JessicaWebster@annarbor.com. You also can follow her on Twitter or subscribe to AnnArbor.com's email newsletters. Tue, Jun 25, 2013 : 3:16 p.m.
Biercamp - great stuff and nice people! Tue, Jun 25, 2013 : 4:07 p.m.
Tue, Jun 25, 2013 : 1:46 p.m. He was also having breakfast on the patio at Zingerman's Deli that morning. Tue, Jun 25, 2013 : 4:06 p.m. Sounds like a spent a good portion of the day here. A tweet from Frita Batidos seems to imply that he stopped in there as well. Tue, Jun 25, 2013 : 12:42 p.m. In other news, Biercamp closes for the summer as Batali buys everything. Tue, Jun 25, 2013 : 1:56 p.m.